Blog-Daytona Beach: Sun, Fun and ...Bikes? Blog-Did you know...Teledyne Marine provides key enabling technology for global tsunami warning systems? Blog-Improved Optical Return Loss in Subsea Connectors, and What's Next? Blog-Inspiring our Next Generation of Explorers! Blog-NEKTON First Descent - MISSION LOG: February 2019 – Departure from Bremerhaven and 1st part of the mobilization done. Blog-Plastic in our Oceans - Know the Facts! Blog-So You Want to Save Energy: A Unique Application of 3-D Multibeam Sonar Technology and Best Practices to Optimize Sediment Removal Operations at Port Facilities. Blog-VIDEO: So You Want to Save Energy - A Unique Application of 3-D Multibeam Sonar Technology and Best Practices to Optimize Sediment Removal Operations at Port Facilities. 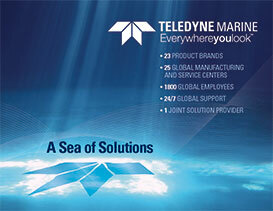 Welcome to the Support pages for Teledyne Marine. We are here to support your enterprise! Teledyne Marine understands the cost of down time, whether planned or unplanned. Therefore, providing the Industry's best service and support is our most important endeavor. Through the links below you will find support contact information for all of our brands. Over the next several months we will be releasing enhanced service pages that will provide 24/7 access to expanded support information for our products.